Tarragon soda was invented by Mitrofan Lagidze in Tbilisi in 1887, and I already talked about Lagidze’s beverages here, in another post. 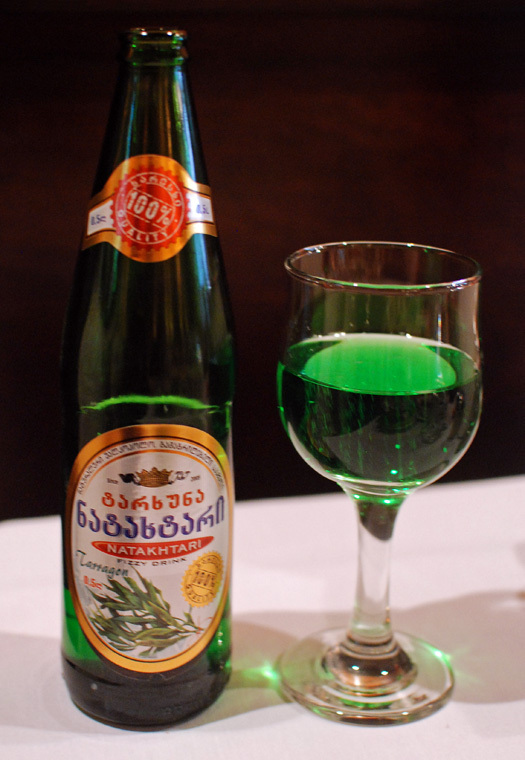 But it wasn’t until 1981 that Soviet Union started mass production and gave Tarkhun (whose name is derived from the word for tarragon in Georgian and other languages from around the Caucasus) its distinctive color by adding malachite green, a dye that is now considered toxic and banned in most countries. Don’t worry though, my recipe’s entirely safe and natural! Color. The tarragon syrup will be pale green right after you make it, but will quickly turn yellow. The role of the baking soda and the ice cubes in my recipe is actually to slow down that “yellowing” process, but it can only do so much. If you’re willing to make the recipe a bit more complicated, you could add the lemon juice at the last minute, when assembling the soda — acidity is a big factor in the color. You can add a drop of (FDA-approved) green coloring in each glass for a vibrant result (see my picture below). If you want to reproduce the color of the commercial versions (as in the picture at the very bottom of this post), you would probably need to add some blue coloring too. Or you can just choose to consume the all-natural yellow version. Clarity. 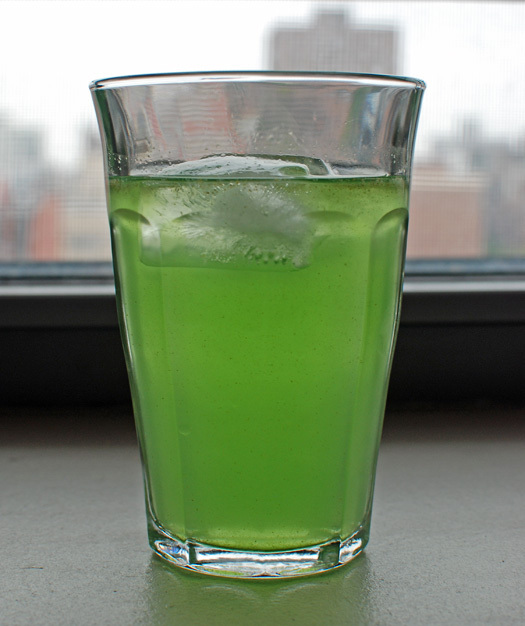 Chances are your soda will still contain small tarragon particles. There’s nothing wrong with that, but if you want a clearer beverage, you should consider using a 100-micron superbag. Now THAT will make you a true Tarkhun aficionado! In a saucepan, bring the sugar and water to a boil, stirring constantly. Mix in the baking soda and tarragon, cook for 1 minute and remove from the heat. Transfer to a blender and process until smooth. Add the ice cubes and lemon juice and process again. Pass through a fine chinois and refrigerate. For each glass, Mix 2 oz syrup with 6 oz sparkling water and a drop of food coloring. Top with ice. Enjoy! 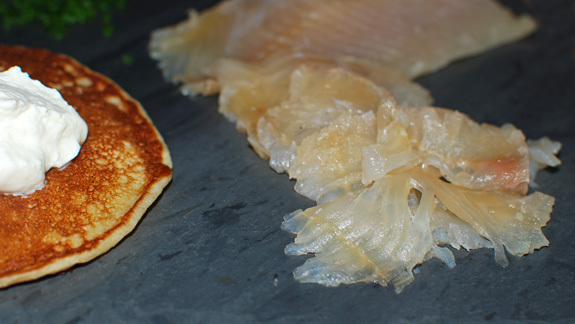 A few weeks ago, I was promising some recipes inspired by my trip to Abkhazia. I’ve already delivered the achma and the Adjaran khachapuri, but I had to redo this recipe countless times. I started with the idea for a black tea cake with a mandarin sauce, two ingredients characteristic of Abkhazia — check out my pictures from the food market in Gagra. As it turned out after many experiments, it takes tons of black tea to get a flavorful cake, and even then the result is OK but not spectacular. So I introduced a third local ingredient (honey), added an ice cream, and played musical chairs with the flavors. 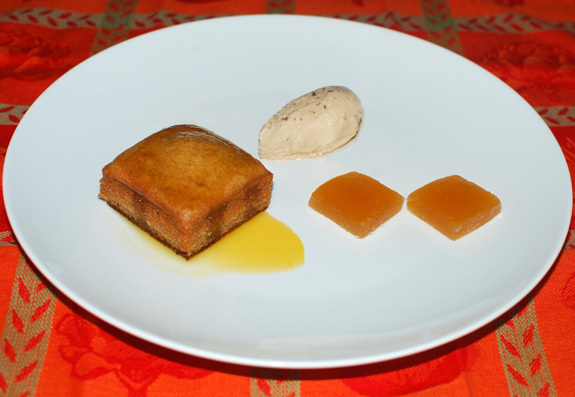 The final version now has a honey cake, a black tea ice cream, a mandarin sauce and madarin pâte de fruit. The ice cream recipe is adapted from Ice Creams, Sorbets and Gelati by Caroline and Robin Weir, the brand new edition of a book I already mentioned here. I’m using Nilgiri black tea, but I encourage you to go to your local tea shop and pick a strong black tea you like. The ice cream recipe is written for way over 4 servings, as you need a substantial minimum amount for most ice cream machines to work properly. The mandarin pâte de fruit is equally challenging to scale, because you need a dish of the right size when you let it set. If, like me, you live in a climate where mandarins are rarely available, you can replace them with tangerines or oranges. Finally, every pectin is slightly different. I am using the powdered apple pectin from Rousseau, available here. While mixing the mandarin juice in a blender on low speed, pour in the pectin and blend until homogenous. Heat in a sauce pan over high heat and bring to a rolling boil, stirring constantly. Add the sugar progressively, bring back to a boil, and boil for 1 minute. Stir in the lemon juice and remove from the heat. Pass through a chinois into an 4″ x 8″ dish lined with plastic wrap. Cover with more plastic wrap, and refrigerate for at least 4 hours. Take the pâte de fruit out of the dish, remove the plastic wrap, and trim the edges. Cut into 18 squares, then coat in superfine sugar and refrigerate. Place the mandarin juice and sugar into a saucepan over high heat and reduce by 1/2. Pass through a chinois and refrigerate. Place the butter and honey in the bowl of an electric mixer fit with the paddle attachment, and whip on high speed until creamy. Mix in the egg, sour cream, milk and salt on medium speed, then sift in the flour and baking soda in a couple additions. Place a dish of water at the bottom of a 350 F oven. Grease the inside of four 2 3/4″ square ring molds, and place on a sheet tray lined with greased parchment paper. Pour the batter into the molds, and bake about 25 minutes, until golden brown. Transfer to a wire rack and let cool. In a saucepan, bring the milk to a boil, let rest for 1 minute, and stir in the black tea. Let steep for 30 minutes, then pass through a chinois, squeezing the tea leaves with a spoon. In a bowl, whisk the egg yolks with half of the sugar to a ribbon. Place the rest of the sugar in a saucepan with the flavored milk and the heavy cream, and bring to a boil, stirring regularly. Pour into the bowl while whisking, then place the bowl over a pot of simmering water and cook the custard until it coats the back of a spoon (about 185 F), stirring constantly with a rubber spatula. Pass through a chinois into a container that’s sitting in a bowl of ice water, and let cool. Transfer the container to the freezer and wait until it is completely cold. Churn the custard in an ice cream maker, following the manufacturer’s instructions. Transfer to the freezer for at least 4 hours. When serving, sprinkle some smoked sea salt on top. 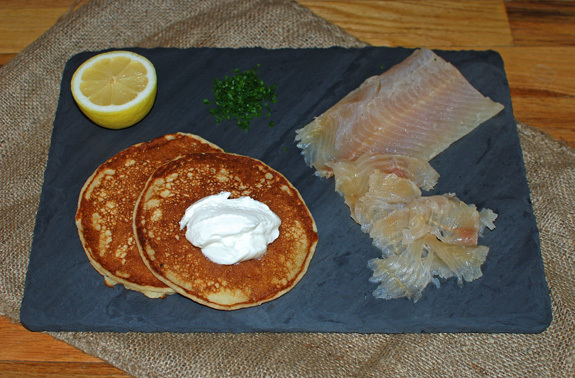 Don’t let barbecue season lure you away from more gourmet food. 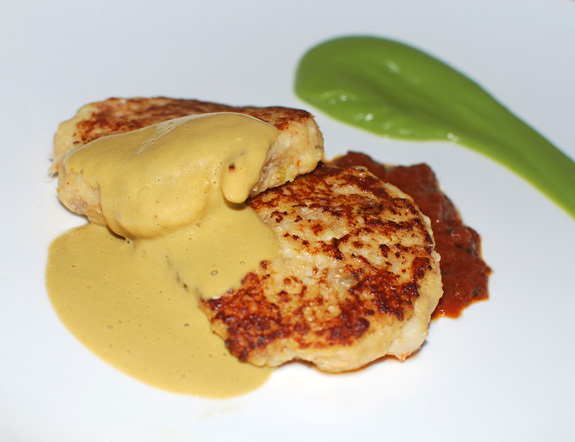 There’s no need to wait until the next holiday season to eat foie gras! Washed down with some chilled dessert wine, it makes a lovely snack on a warm afternoon. Hungary is the world’s second-largest producer of foie gras (Bulgaria is the third-largest). While their production is mostly from goose liver, in the United States duck liver is the norm, and about 99% of it is produced in the Hudson Valley. I usually get mine from D’Artagnan. Make sure you buy fresh, grade A, whole foie gras. Frozen foie gras will result in a soggy texture — as if your terrine had been pre-chewed — and is a complete waste of your time and money. I used to make this recipe in a terrine mold, which I cooked in a dish filled with water in the oven. Then I realized that I got a better result (for slightly less effort) by using plastic wrap, a sous-vide pouch, and a water bath. 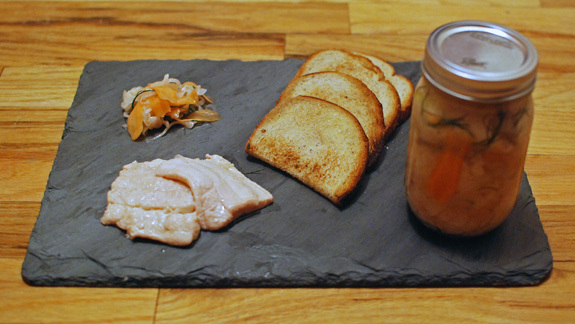 So it’s technically no longer an actual terrine; it’s closer to a foie gras au torchon, only a bit less neat-looking. If this really bothers you, you can go back to using a good old terrine mold, with the same ingredients. 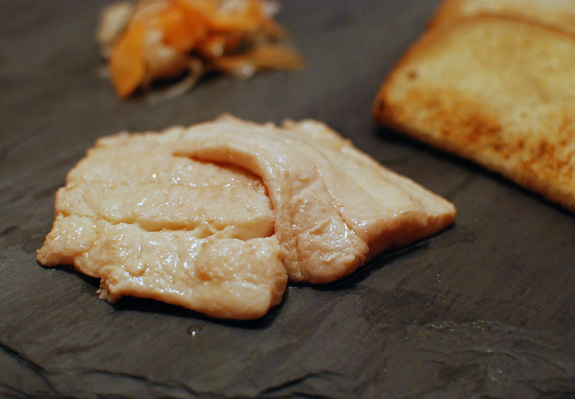 The prepared foie gras can be kept for about 1 week. Serve with quince preserves, toasted brioche-style Pullman bread, and dessert wine. Or serve with toasted bread and a salad, as is often done in Hungarian restaurants. Soak the foie gras in hot water for 30 minutes. Drain and pat dry. Separate the 2 lobes of the foie gras. In each lobe, make a 1 cm deep incision lengthwise using a knife. Pull out the veins with the knife (or use your fingers). You should find a few veins running lengthwise. Remove the smaller veins as well, but don’t overdo it — you don’t want to turn the top-quality whole foie gras into some cheap trimmings. Your lobes should each still be in one piece once you’re done. In a bowl, mix the salt, sugar, sweet paprika, nutmeg, garam masala, Tokaji wine, and apricot brandy. Coat both sides of the lobes with the mixture, and put back together to form a vague cylinder. Wrap very tightly in several layers of plastic film to better shape the cylinder, then refrigerate for 12 hours. 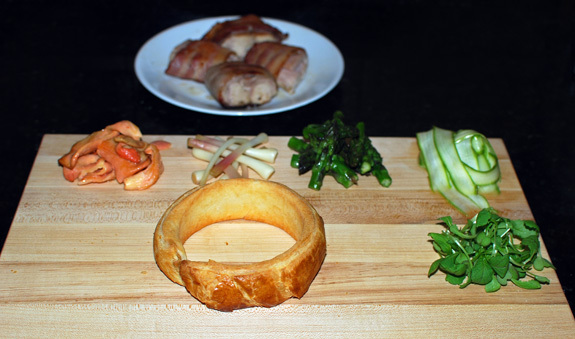 Place the foie gras log into a sous-vide pouch, and vacuum seal. Cook in a 54.5 C / 130 F water bath for 1 hour, then let cool and refrigerate for at least 2 days. To serve, remove from the fridge 30 minutes in advance. Take the foie gras out of the pouch, peel off the plastic wrap, and slice with a hot knife. Ramps may be native to North America, but their cousin, wild garlic or bear’s garlic (cheremsha in Russian), is found throughout Europe, all the way through the Caucasus. Due to their relatively short season — as little as one week long in mountainous areas — they’re often pickled. The recipe may seem long, but each preparation is in fact very quick. Try to follow the same sequence as below to optimize your time. And don’t forget to check the Lazy Boris Corner at the bottom of this post! Place the white wine, vinegar, clove, juniper berry, peppercorns, caraway seeds, mustard seeds, garam masala, bay leaf, salt and sugar into a saucepan, cover with a lid, bring to a boil and simmer for 3 minutes. Let rest for 15 minutes. Pass the pickling liquid through a chinois, then add the ramps. Transfer to a small jar or a sous-vide pouch, let cool and refrigerate for at least 2 days. Season the rabbit with salt and pepper on both sides, then place into a sous-vide pouch with the thyme and butter. Cook in a 146 F water bath for 12 hours. Reserve. Using a vegetable peeler, cut asparagus shavings lengthwise. Transfer to a bowl, toss with salt and olive oil, and reserve. Roll the puff pastry to a 6″ x 12″ rectangle, about 1/8″ thick. Cut four 1.5″ x 12″ strips. Rub the butter on the outside of four 3.5″ diameter, 1.5″ tall ring molds. Place a strip of puff pastry around each of them, sealing the edges with egg wash. Place on a sheet tray lined with parchment paper, brush the pastry with more egg wash, and bake in a 425 F oven for about 15 minutes, until golden brown. Let cool. Delicately remove the puff pastry rings from their molds, using the tip of a knife if necessary. Reserve. Place the asparagus spears in a small saucepan with the butter and water, season with salt, cover with a lid and cook over low heat until almost soft but still slightly crunchy. Remove from heat and reserve. Melt the butter in a small saucepan over medium heat. Add the mushrooms, season with salt and piment d’espelette, and cook until just soft. Remove from heat and reserve. Melt the butter in a small saucepan over medium heat, and sweat the onion and garlic until soft. Add the white wine, and reduce to about 1/3 over high heat. Stir in the sour cream, and let rest for 15 minutes. Process in a blender until smooth, pass through a chinois and reserve. Take the rabbit out of the sous-vide pouch, cut into 4 pieces, and wrap a slice of bacon around each piece, with a generous overlap. Sauté in a hot pan until the bacon is brown and crispy on all sides. Chop each piece into 4 smaller pieces. 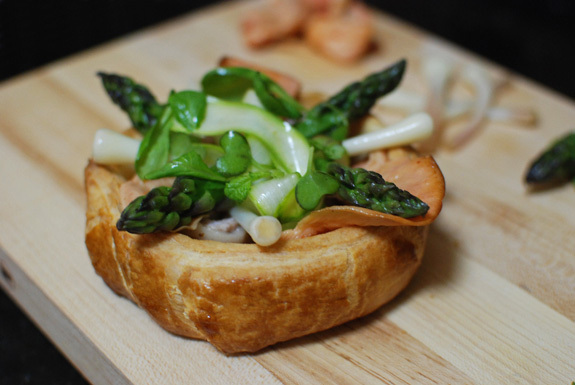 In each pastry ring, arrange 4 small pieces of rabbit, and top with 4 pieces of mushrooms and 4 asparagus spears. At this point, you can reheat the bouchées in a 350 F oven for a couple minutes if you like. This is not meant to be a hot dish but more like something slightly warmer than room temperature. Add the asparagus shavings and micro red mustard in the center, and serve with warm smitane sauce on the side. You can buy very good pickled ramps here. You don’t have to cook the rabbit sous-vide: cut the loin into 4 pieces, wrap each piece into a slice of bacon, sear in a hot pan, then cook in a 350 F oven until done. 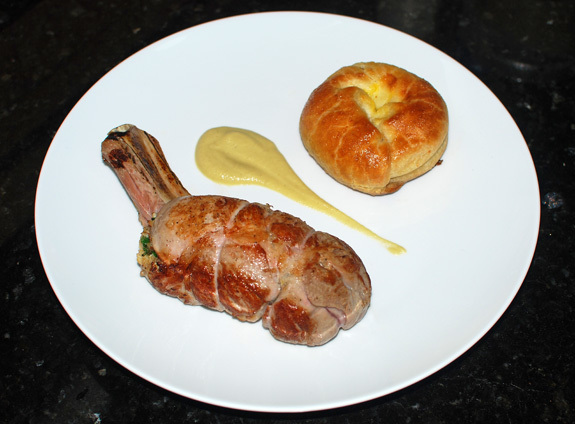 You will loose the divine texture of sous-vide rabbit, but the result will still be good. If you have a good blender, you don’t really need to pass the smitane sauce through a chinois. The micro red mustard can be replaced by other kinds of microgreens, or omitted altogether.